At the heart of Orlando Chamber Choir's Christmas concert is Thomas Tallis' large-scale Missa Puer natus est nobis, based on the festive plainchant of the same title. The choice of this particular Latin text suggests that the mass was written during the reign of Queen Mary, and the seven-part scoring indicates that Tallis had more extensive forces at his disposal than just the English Chapel Royal. This all points to a first performance in December 1554 when Spanish King Philip, Mary's husband, was in England with his Capilla Flaminca. 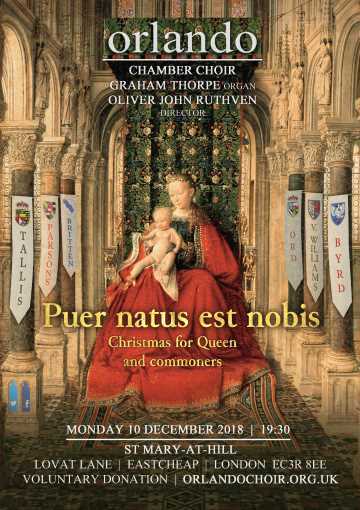 It is likely that the rich and sonorous Missa Puer natus est nobis ("Onto us a boy is born") was also meant to celebrate that Queen Mary was thought to be pregnant at the time, and hoping for an heir. ...but the stars of Orlando Chamber Choir's Christmas concerts are invariably the audience when they join in with the traditional carols! There will be festive readings too - with wine, mince pies and an interval raffle to complete this all-sensory Christmas evening.